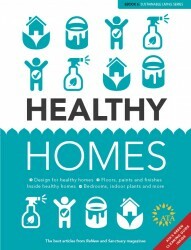 The Healthy Homes eBook contains the best articles from ReNew and Sanctuary magazines on how to achieve a living environment that won’t impact on your health. The book is available as PDF download only. This publication is FREE for ATA members (please login using your ATA webshop account). The Healthy Homes eBook, from the ATA’s sustainable living series, brings together the best articles from ReNew and Sanctuary on how to achieve a living environment that won’t impact on your health. Read about designing for good ventilation and air quality; how to choose non-toxic materials and finishes for your home; and even how indoor plants can help. Take a look inside some beautiful healthy homes, and get some tips from the ATA’s Green Cleaning Guide. This is an interactive pdf (7 MB) that can be downloaded on purchase. This publication is FREE for ATA members (please log in using your ATA webshop account).